One of the most affordable and easiest ways to improve your smile is with teeth whitening. At Village Family Dental in Clemmons, North Carolina, the experienced team of dental specialists uses sodium peroxide and Philips Zoom teeth-whitening products to create whiter smiles. To find out more about teeth whitening, schedule a consultation over the web or call today. Your teeth turn yellow for a variety of reasons. The foods you eat and drink, certain medications, and age can all be contributing factors. Red wine, tea, and coffee can all stain the enamel on your teeth, making your teeth appear yellow. Smoking and other tobacco products also stain teeth. Over time, surface stains can reach beneath your tooth’s enamel to its dentin, which makes stains harder to remove. Yes. Whitening your teeth is a safe process when you follow product guidelines and instructions. The dental team at Village Family Dental offers Philips Zoom whitening treatments for safe, satisfying results at home and sodium peroxide treatments in the office. Your teeth appear whiter after just one in-office treatment. Using take-home teeth-whitening kits is a more gradual process. No matter which course of treatment you choose, the Zoom whitening solution is entirely safe to place on your teeth and in your mouth. You can experience minor, temporary gum and tooth sensitivity as a result of the bleaching agents. What is the Zoom in-office procedure like? Zoom in-office teeth whitening is simple, and can whiten your teeth up to eight shades in just one visit. * During your appointment, one of the experienced dentists at Village Family Dental fits upper and lower dental trays into your mouth. These trays contain a hydrogen-peroxide whitening gel. That’s it. You’ll have whiter teeth and a gorgeous smile in about two hours. 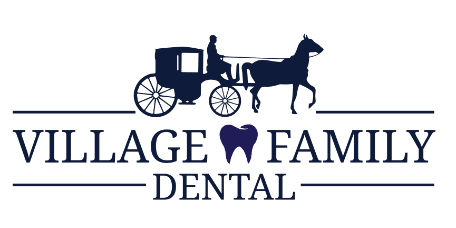 Village Family Dental team members offer a take-home teeth-whitening kit for a less immediate approach to whitening teeth over the course of several weeks. Call or schedule a consultation at Village Family Dental to learn more about Zoom in-office and at-home teeth-whitening treatments. Give yourself a smile you're proud to wear!